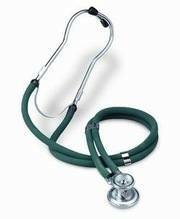 An accurate stethoscope designed for all purposes. The various combinations help discern low and high frequencies and hear the faintest murmurs with ease. 5 in 1 Zinc alloy treaded with chrome plated chestpiece drum fittings with 5 different sized chestpiece bells provides highly useful detection of a wide range of heart and lung sounds. Two 22" latex free seperately thick wall tubing provides individual sound transmission from chest piece to both side of the ear. 3 plastic non-chill bells 1-1/4", 1" and 3/4"